May has mostly been a planting month, but there are a few fall-planted things that are ready to harvest. One of them is our garlic. The other day the ground was dry and with a new forecast for lots of rain, I wanted to get it out of the ground. years now and somehow have ended up with both hard and softneck. When garlic leaves begin to die back, it's time to harvest. I've learned the hard way that if I wait too long and the leaves die off completely, then the bulbs are harder to find! I lay them out on my front porch to cure. Garlic needs to cure before it goes into storage. Curing allows it to dry thoroughly and it's usually dried with the green leaves attached. Sometimes they are braided together, which makes an attractive thing to hang in one's pantry or kitchen. This year, however, I decided to do something different. 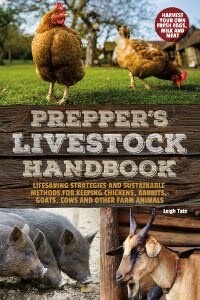 When I was researching natural wormers for Prepper's Livestock Guide, I learned that some farmers feed whole garlic plants to their cattle as part of their deworming program. The raw bulbs are the most potent anthelmintics, but I suppose the leaves contain traces of garlicky goodness. As a source of calcium, potassium, magnesium, manganese, copper, and selenium, that's a lot of goodness. So why not add the leaves to my homegrown goat vitamin and mineral blend? The difference between when I wrote that post in 2013 and now, is that I'm drying herbs and greens for my goats on a much larger scale. Several years ago I switched from my food dehydrator to air drying on window screens. to build me a better one in my future milking room. As long as the humidity is low, things dry within several days, and then they are mixed into the goat blend. If it's humid out they take longer to dry, and I have to stir it several times a day. Something else that I harvested this month is my sugar beets. More on what I did with them next time. I am most interested in the outcome. Literally. As it is my experience that what goes in goat comes out and can leave an off taste to the milk with the likes of garlic and onions especially. So what is the verdict? Goatldi, I've been feeding garlic to my goats for a number of years now and have not had problems with flavor in the milk. I don't feed it daily, mind you, only as an antibiotic as needed or once a month as part of my worming program. Powdered garlic is included in a number of herbal wormers so I'm going to guess that in general small amounts once a month don't cause a flavor problem. Dried leaves will be least potent, of course, so I'm not anticipating a problem! Looks great, Leigh. Garlic is the one and only thing I have consistently been able to grow over the years. I have read about its deworming properties but have never had any livestock to test it on. Wow! My fall planted garlic won't be ready until the end of July- you're harvesting yours already! That's amazing! Paula, after a wet and chilly April we had a really hot dry week earlier this month. It started to dry out then, so I thought I'd better get it out of the ground! Nice to have fresh garlic. No wonder I've never had worms. I love garlic! Hi Leigh! I am new to your blog this week and as I've been reading, feel as if I have discovered a priceless treasure. 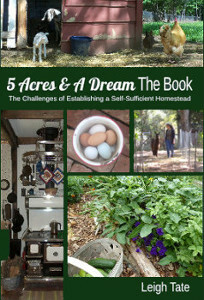 In early June my family will move from a subdivision to a five acre farm nearby. Our vision is similar to yours and your candid and thorough blogging has helped define some starting points for us and given me inspiration and excitement to start well and with purpose. I have started reading from the beginning of your blog - staying up late, taking notes, and thinking. I just got through 2009 and am eager to continue. Already I have learned so much. Thank you. As a side note, that tiny shower you had reminded me of the "master bath" in and old church parsonage we lived in years ago. An older man familiar with the design told us that we might be better off soaping up the walls then spinning around in a circle to show er! Rachel, welcome! And congratulations on you upcoming move! I appreciate your kind words about my blog, and am happy that it encourages you. I believe in this lifestyle, even though there's a lot to learn in making the transition. Pretty funny about your former shower! A Very Exciting "Coming Soon!!!" What Can I Live Without?